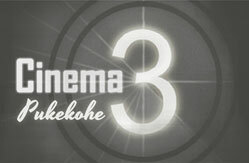 Cinema 3 is a locally owned and operated 3-screen complex featuring the very latest in digital technology. HOLIDAYS! School holidays are our busiest time. Booking, either over the 'phone or online, is thoroughly recommended to avoid disappointment! ONLINE BOOKING To book online go to the film you wish to see and click on the time you wish to see it. This will take you to a booking page and it's pretty straight forward from there. If you prefer then please call the cinema and we can take your booking.